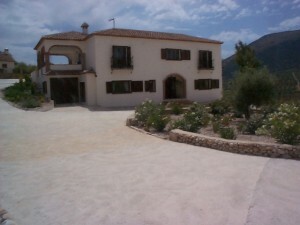 Absolutely magnificent country villa set on two levels with 2 detatched guest cottages. This exclusive property is just 2 minutes from the beautiful village of Fuente Camacho & less than 1 hour from Malaga & 30 minutes from Granada. No expense has been spared in its internal finish & decoration & externally it lies within its own landscaped gardens. The main house comprises on the upper level with independent access - large entrance hallway, bathroom, utility room, dining room/study/bedroom 6, kitchen, dining area, large sitting room of 72 sq mtrs, at the lower level is an entrance hall , 2 double bedrooms each en suite plus a master suite of bedroom, en suite bathroom, dressing room & sitting room. This is a very prestigious property & is fully centrally heated, Airconditioned with all services including telephone, broadband internet, satelite TV. Externally there are 2 detatched cottages - one with two double bedrooms & one with one double bedroom - each has large sitting room & living areas plus bathroom & well equipped kitchen. There is a large integral garage and storage area and a lovely gated entrance with driveway and access to each area of the property. It is fully fenced and has beautiful panoramic views. Various rooms in the house lead out onto terraces with wonderful views. The gardens are fully landscaped and irregated and include a BBQ Area, a poolside bar, numerous terraces and leisure areas plus a large contoured pool. This is an exquisite property and if required would provide a sizeable rental income from the cottages. If you want that millionaire lifestyle at a very affordable price then this is a property to be viewed promptly. Priced to sell and an absolute gem!